WhiMSy love: Rule #2: Never act like a cheetah. Rule #2: Never act like a cheetah. 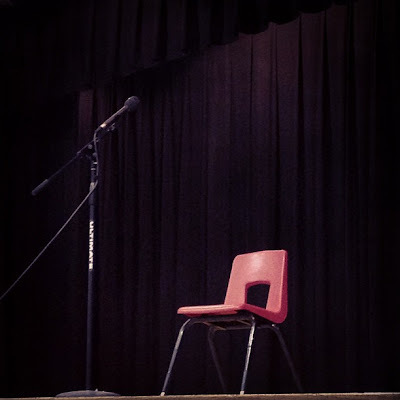 I took the girls to their elementary school talent show a couple weeks ago. They went to support their friends performing in the show. I think Zoey & Pazely really wanted to be IN the talent show themselves, but they couldn't think of a talent to do. They are, I admit, talented little humans. But I'm just not sure they have (as of yet) a talent that is ready for a performance-type setting. Do you want to watch someone juggle 2 balls? Or sit, watching from afar, while someone draws puppies in their sketchbook? Would you be willing to watch a magic show where the magician kindly asks you to close your eyes right before "the big reveal"? Do you want to hear half of the holiday jingle "Up on the Rooftop" played with two fingers on an out-of-tune piano? My favorite performance was when a 2nd grade little boy got on stage with his electric guitar. His rocker dad helped him set up a bright orange mini amp. The microphone was set a bit too high, so while the boy sang a blues song about cats, he also stood on his tippy toes. I also loved the boy who played the violin. That's talent. And I'd have to say the trio of girls that performed The Cup Song were rather entertaining. One 4th grader got on stage, just she & the microphone, & began singing. No canned music. Just the melody coming out of her mouth. It was a song she wrote. It was so quiet in the room. And I thought, "How brave she is." There were tons of girls decked out in 80's gear. Bright neon. Big hair. Fingerless Madonna gloves. I loved it. It was a flashback to my own days of elementary school talent shows. The MC was a beauty queen wearing a skirt too short, paired with shoes too tall. I was mortified at how much leg I saw. Some performers simply cartwheeled back & forth across the stage for 3 minutes straight. Most acts involved a song loudly playing while the talent show performer sang over the voice of the actual recording artist on the CD. So strange. I turn on the radio & do that every day. What happened to the awesomeness that is lip singing? That was the thing to do when I was a kid. In fact, I can clearly recall my lip-singing performance in 4th grade of "Let's Hear it for the Boy" by Deniece Williams. ...Oh-oh-oh, maybe he's no Romeo, but he's my loving one-man show... Ok, I admit. That's not really fitting for a 9 year old to sing either. An almost 10-year old shouldn't be singing songs about a boy pulling her near & it making her want to cheer. Some of the stuff was flat-out painful to watch. I was regretting that I hadn't brought those 2 balls. And I became instantly motivated to get a more rigorous schedule in effect for Zoey's piano lessons. I looked around & noticed 5th graders flirting. WHAT?! I saw 2nd grade thugs. HUH!? And you better believe I had something to say to the 6th grader who took my jacket off the seat I was saving, & tossed it aside as she declared something about how her & her friends "...HAVE to sit in the front row." I grabbed a chair, stuck it at the end of the row & had her & all her friends shimmy their buns down the line, while explaining that the jacket she tossed aside was MINE & was put on the chair for a REASON. I endured evil glares of disrespectful 12-year old girls, as thoughts about how unawesome I was filled their noggins. At halftime, cookies were served. I saw swarms of elementary kids attack the table of cookies, grabbing entire boxes of treats for themselves. Like hungry cheetahs pouncing on their prey. Some children even stuffed half a dozen cookies or more into their pockets. Kids dropped cookies on the floor, stepping on them, unaware, & making a mess. Greedy punks. My own kids began to pout & saw the unfairness of how they each only got ONE cookie. I had them turn around & look at the dozens of people that didn't get ANY. I used many examples of the night at the talent show to explain to my girls how NOT to act. (For example: Rule #1: Don't wiggle like that. But I also apologized for not being more encouraging about getting them on that stage with their own act. We will polish our skillz & give it our darnedest next year. As a mom of 6 & 10 year old. I cannot agree with you more. I was shocked at some of the songs that were played at one of their school dances. Older siblings were dancing like they were in a club not in an elementary school gym. I am a high school senior, and I am appalled by the things that went on at that talent show. Some kids can be so rude, and many girls nowadays grow up too fast. It sounds like you are raising your girls to be polite and respectful to others, which will take them far in life. I wish your girls the best of luck in next year's talent show!